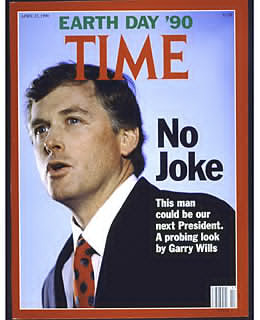 For those of you old enough to remember former U.S. Vice President Dan Quayle he was made out by the mostly left leaning US media as their version of Erap. Dennis Miller went as far as suggesting that then President George H. Bush should have no fear of assassination since his allegedly incompetent VP acts as a living bullet proof vest since no one would want to see him act as president. In his day he was perceived as so incompetent that he served as a “bullet proof vest” for his own president. We never did find out what the US would have been in the hands of Dan Quayle. So called thought leaders in this country though like using current VP Jojo Binay as their own bullet proof vest for President Noynoy Aquino. As if whatever the perceived faults of Binay will excuse anything Noynoy has ever done or will ever do as president. Let’s get something out of the way right now, I am no Binay fan. You know someone by their friends and very early on I knew a significant friend of Binay is Erap. Both are popular in this country and people wonder I am not a proponent of pinoy pride. For all of his games with numbers I really hope there is a court with balls to prove that he did something wrong if he did it. The fact that no one has come close is either an indication of the skill of Binay or the ineptitude of the justice system here. Jojo Binay says that this is senator material. For that alone he should be flogged. The one crime I can convict Binay of without a doubt is him hoisting his simpleton daughter upon this nation and telling them that she was worthy of being a senator. Of course the simpleton electorate believed him which is on us. Still just because you can do something doesn’t mean you should. He is not being dumb by saying that but smart for knowing his audience. But that is what politicians do. They prey on the ignorant and the best way to keep it all going is to make sure the ignorant stay ignorant. Hence that is why the line between pinoy showbiz and pinoy politics is so blurred: both need an ignorant nation to maintain the status quo. A system dependent on ignorance can not be smart. Proud to be pinoy !! There is no single quote that describes our moron politicians and the people who vote for them. When Noynoy won in 2010, us people who knew better had to grin and bear it because it was the will of the people. Why is Binay any different ? He was elected by the people just like Noynoy. I even have a better question, if Binay is as horrible as all the Noynoy worshippers say he is :why has your corruption busting idol never lifted a finger against him? Repeat after me: there is no Daang Matuwid. Please refer to P.T. Barnum’s famous words. Noynoy has no accomplishments in life so you have to snicker at the thought. I do not like Binay and all his family stands for. I was the first one in GRP to point out the silliness of his daughter being a senator. I always expect idiocy from pinoy voters and in 2013 they did not let me down in that department. I will give the devil his due though. Unlike Noynoy Aquino, Jojo Binay got to where he is by hustle. A word apparently missing in the vocabulary of Noynoy. Of course in his little world Noynoy Aquino believes someone who has spent much of his adult life is suspended animation is worthy of the Nobel Peace Prize. 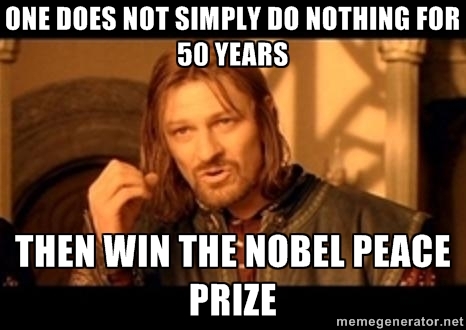 Last I looked the Nobel Prize was won by competent people who achieve things out of their desire to make the world a better place. Not by someone openly campaigning for it by proposing something unconstitutional that essentially sells out their nation. I want KSP is the root of all evil on my tombstone. At the rate I am going it won’t be long before they bring out the mason. 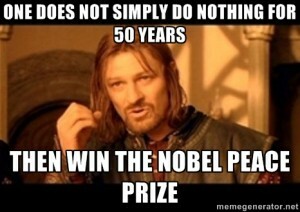 Google this fantasy of the spoiled, entitled brat even being nominated for a Nobel Peace Prize and all you see are local sites. I smell KSP. I smell smoke screen. I smell bought journalism. Reminds me a lot of how local media love to attach Manny Pangilinan’s name to any NBA team that is even thinking of looking for a new owner. I find it weird that an NBA team that will be sold to anybody is never mentioned in websites that cover the NBA like ESPN. 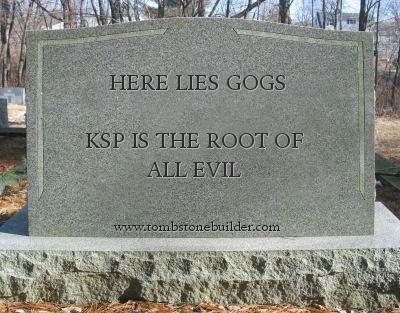 KSP is the root of all evil and if you have an imaginary NBA team or an imaginary Nobel Peace Prize in the Philippines you will still get your pansin. Noynoy says pope is thinking of somebody else. Oh yes DAP completely ethical. 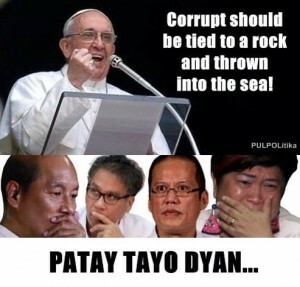 Binay, Aquino , Drilon , Ochoa all of them trying to epal themselves to Pope Francis when they are all the very essence of what should be tied to a rock and thrown to the sea . All these politicians believe that if they have proximity to greatness that they themselves will be great. Noynoy claims that the pope ‘s warnings were not directed to him despite him being president for four years. Pinoy politicians are essentially selfish, immoral people who spend their time in public office trying to make you believe then opposite. Noynoy in front of the pope accuses church officials of being quiet. Yet when they ask for him to resign it’s weird how alleged yellow media made church officials quiet. Noynoy acted bereft of maturity when given the privilege of addressing the pope. When boiled to its essence: ” me good, them bad” . 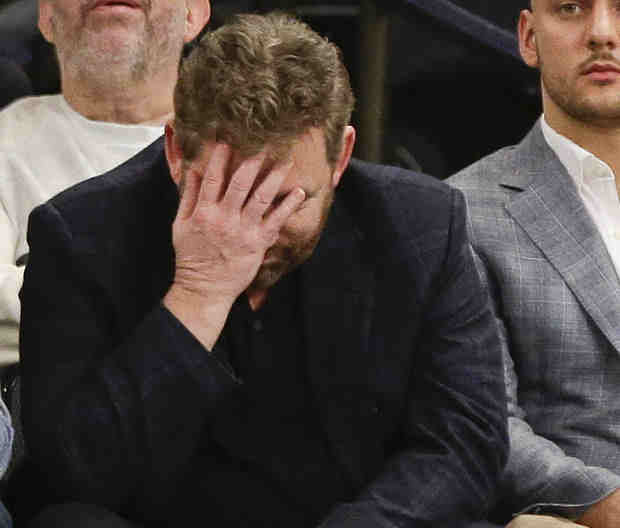 New York Knicks owner James Dolan recently responded to a fan and it was comical. So comical I wonder if he went to Noynoy for some writing tips. If you read what I wrote then there is no doubt where I stand in how I feel about both Binay and Noynoy. Don’t use one as an excuse to allow the other to continue making a mockery of national affairs. Should the two screw things up beyond comprehension well let’s all remember who voted for both . This seems to lead to an excessive amount of time in pursuit of happiness. Endless parties, fiestas, anniversaries, sporting events, beauty contests, and other escapist diversions seem to be the order of the day and night. Expressions of negative feelings such as anger are almost always frowned upon. This type of behavioral value system is obviously compensatory. With large segments of the population facing overwhelming insecurity, anxiety, and fear; denial and distraction seems to be the only course open to the poor. I may not be able to control the environment; but I can control how I feel about it. What impact does the happiness factor have on voting patterns? Perhaps this explains why Filipino voters continue to pick the same type of candidates from the same dynasties again and again. They seem more concerned with maintaining happiness ; than they are on selecting a new type of candidate whose policies may be more beneficial to the country, than those who came before. A good read. Just great. Can’t say more. Anyway, they elected , Lito Lapid, also, who barely can understand laws or the English language. They voted Erap Estrada, who is a college dropout, as President. This is the deal – plain and simple. At the end of the day, Pnoy will support Binay, openly or clandestinely. Why? The trade-off! Binay, if he wins, will ensure that Pnoy will not be prosecuted for his, his relatives’, and/or his men’s crimes of commission (commission here means, yes, you’re right, both of them) and omission. This is a deal made in hell. Why doesn’t a politician or columnist of national repute, ask Binay to pledge that he will NOT pardon the three senators currently under arrest for pork barrel thievery? If he refuses to make the pledge, it can be used as fodder by those running against him. It can be actually ask in a presidential debate. A ‘deal’ don’t matter anymore nowadays. Erap, Gloria, Enrile, Jinggoy, Bong, Corona, Napoles, etc. If a ‘deal’ still works today you are not going to see those names up there in the plunderer’s marquee. We need to reformat the system of the Philippines. Not reboot, but reformat. I think we need to start from scratch. Oh, that gives me the chill! I have viewed the Senate Inquiries of the Generals involved in the SAS operation. Did this Idiot General ever heard of the Global Positioning System (GPS)…? From this he can calculate the “Angle of Trajectory of his Artillery”…even without firing Phosporous bombs…incompetent people wearing Stars on their shoulder boards? I think for some it make sense because the comparison is not like the devil and the deep blue sea. It’s about the devil and the shallow stinking sea. It’s about the hustler and the incompetent fool. If the choice is limited to the two, people will go to the one whom they see as the lesser evil or the one who inflicts damage less. Let’s get something out of the way right now, I am no Binay fan. I think you are more known as PNoy-hater than a non-Binay fan. And that’s where the problem lies because your confession don’t really matter since you will surely find Binay a place in your heart when worst come to worst simply because you hate PNoy to the bones. Is Binay being used as bulletproof vest for PNoy? I don’t think so. I see the analogy with Quayle a bit twisted. Binay is no Quayle. The former is popular and seen as the next possible president. Quayle doesn’t even come close to that. Actually, he is the opposite of Binay. It is PNoy who is closer to what Quayle is. Both are seen to be underserving of the position as president and both are not really admired for their intellect or political savvy. For the majority, it is not really about ‘hating’ Binay and loving Noynoy, it’s about letting things as they are. It’s about abiding by the system we have to effect change. If Binay gets to win the presidency eventually, so be it. In the meantime, PNoy is the president and in the absence of justified reason people don’t see him stepping down. tell that to barack hussein obama! haha! 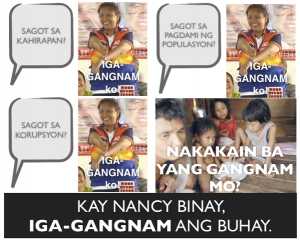 Nancy Binay nagga-Gangnam sa kanyang kampanya. Botante: Sige pa, sayaw pa! Tuloy sa pagsayaw si Nancy Binay. Huminto sa pagsayaw si Nancy Binay. Ang sabi: Ayaw ko nang magsayaw. Pinaglalaruan n’yo na ko. Botante: Sige pa, sayaw pa! Kapag nanalo ka naman kami ang paglalaruan mo!